At the harbor you can moor ships or use the transit. 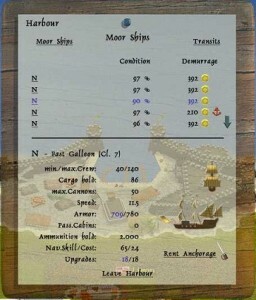 To unmoor a ship you again just click on it and press Cancel anchorage and the red anchor disappears. 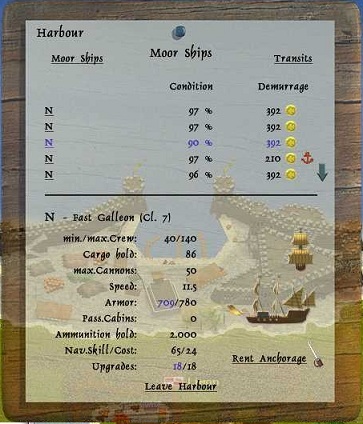 There are of course anchor fees, depending on how many ships you got moored and the size of the shipyard where you moored the ships, you can see each ships anchor fee at the gold coin. 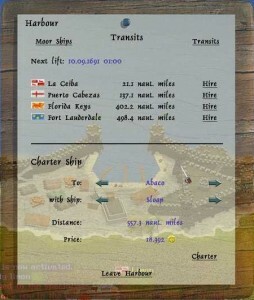 You can also see your moored ships when at sea, by using the fleet menu here. A moored ship will lose condition over time, down to 11% unless it’s a store ship, which don’t lose condition unless shoot at sea. At the top you can hire free transit to some predetermined cities. Can be used in case your rafted at a port you only have ships under construction and no finished ships. Here the governor will believe you already have ships to use and not give you a free sloop. ship class you desire to be transit on. Under that you can see how many naut. miles there is to the city you choose and what it will cost to be transit there. Note that you must harbor your ships, before hiring transit, you cannot sell your last ship so you need to at least harbor one.